St. Martin's Press, 9781137278722, 240pp. The Wall Street meltdown in 2008 brought the country to its knees, and spawned nationwide protests against the lack of regulation and oversight facing Wall Street. But the average American still fails to fully grasp what was—and still is—happening: that the inmates continue to run the asylum. Doyle has been tracking this story for years through his blog Sense on Cents, and exposes here how Wall Street, our politicians, and the regulators themselves have conspired for personal and industry-wide gains while failing to protect investors, consumers, and the American taxpayer. He details the corrupt nature of Wall Street's financial police, who are little more than meter maids imposing fines that amount to nothing more than a slap on the wrist. He exposes the revolving door of Wall Street, wherein the regulators are all former or future employees of the very firms they're tasked with overseeing, and how they routinely serve the interests of the industry itself rather than protecting investors and markets. Recent bombshells—such as multi-billion dollar trading losses at JP Morgan Chase, the manipulation of interest rates via the LIBOR scandal, and money laundering with North American drug cartels and rogue nations such as Iran—are symptomatic of this corrosive culture and the lack of trust and confidence in the system. As the big banks fight tooth and nail to avoid real reforms that would protect the economy, this book is a timely, important, and shocking look inside the Washington-Wall Street conspiracy crippling America and the global economy. Larry Doyle is a former mortgage-backed securities trader who has worked for the First Boston Corporation, Bear Stearns, Union Bank of Switzerland, Bank of America, and JP Morgan Chase. He also served as chair of the Mortgage Trading Committee for the Public Securities Association (PSA). Doyle is the author of In Bed with Wall Street and is a contributing writer for a number of news outlets and financial sites including the widely read Seeking Alpha, Before It’s News, Business Insider, Daily Markets, Benzinga, CNN/Fortune, ForexPros, and Wall Street Pit. He has been interviewed on Fox Business News, CNBC, Al Jazeera English, First Business News, and China Central TV. His work has been featured in Bloomberg Businessweek, Chicago Sun-Times, Financial Times, Forbes, New York Daily News, New York Post, The Wall Street Journal, and Yahoo! Finance. He currently runs his own investment practice and lives in Connecticut. “In his new book, Larry Doyle serves as an expert guide down the deep, dark canyons of our financial crisis. Holding well-needed light to Wall Street and Washington, Doyle pulls no punches. 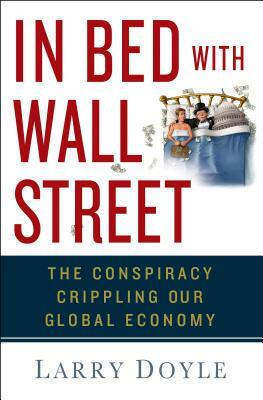 In Bed with Wall Street is required reading in any honest attempt to understand how our financial system failed.” —David P. Weber, Former Assistant Inspector General for Investigations of the U.S. Securities and Exchange Commission, and SEC Whistleblower.